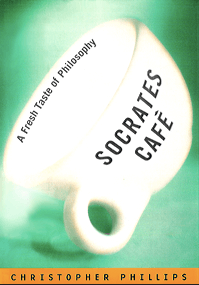 Socrates Cafe Discussion Group may be the upcoming event you’re looking for. This collaborative community discussion group is designed to be a refreshing alternative to the debate that often accompanies topics of great meaning for us as human beings. Do you tend to question things that most people take for granted? Are you keen to hear and learn from other people’s perspectives? Are you interested in collaboratively exploring the breadth of human experience while setting aside any premise of expertise? If yes, then come along and meet others who share your courageous curiosity about life. Bring a question that relates to human experience. Why get married? What is the purpose of art in today’s world? What is happiness? These are just a few examples of the wide range of questions that can be explored during Socrates Café discussion. We will follow a semi-structured format as set fourth by Christopher Phillips, the founder of Socrates Cafe discussion groups (see website for more details: http://www.socratescafe.com/?page_id=84). No reading is required. Please RSVP via email if you plan to attend (kiwiri4144@gmail.com); this will help us reserve enough space at the Dickens Inn. We will be seated at the big table with a sign and a few well-walled candles. Please be prepared to order at least 1 item from the food/drink menu.